I was in Florida last week on Lemon Bay near Venice Fl. Lemon Bay is just getting over red tide, which is a terrible algae bloom. Many fish were killed along with waterfowl. While looking out over the bay, you could still get a whiff of red tide in the air, smells sort of moldy-ish. Luckily, the fish and waterfowl are starting to come back. Amazingly, I came across this Osprey fishing in the bay. Ospreys are magnificent birds that are very good at fishing. This Osprey was circling over head looking for schools of fish. Thank goodness I had my 810 Nikon Camera. In fact, I discovered something about this Osprey that's a little sad......more about that later! 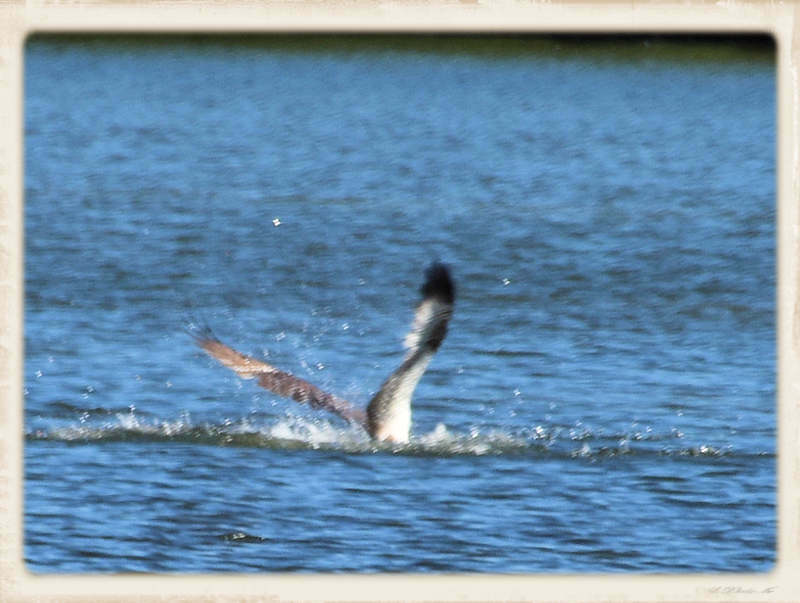 He must have spotted a nice school of fish, because he dove straight into the water at a high rate of speed. I'm sure the fish didn't know what hit him and was probably knocked out by the impact. The osprey was successful. If you look closely, you can see the fish hanging from his talons, the fish is always facing forward. 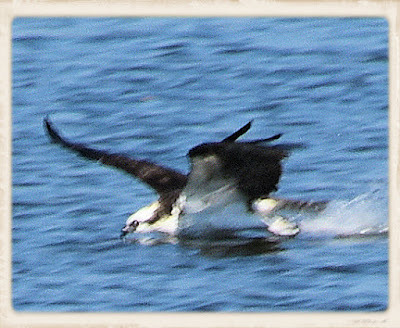 I watched the Osprey as he struggled to get out of the water with his catch. He finally reach a comfortable altitude, his wing beat slowed and he started to search for a place to have lunch. I followed him, hoping that he would land somewhere near. He did, on top of a light pole not over 50 feet from my location. I took many photos of this wonderful bird having fresh fish. I noticed that he was well equipped at eating fish, talons clamping down on the fish, while that powerful beak was used to rip into the fish flesh. It took the Osprey about 30 minutes to finish eating. 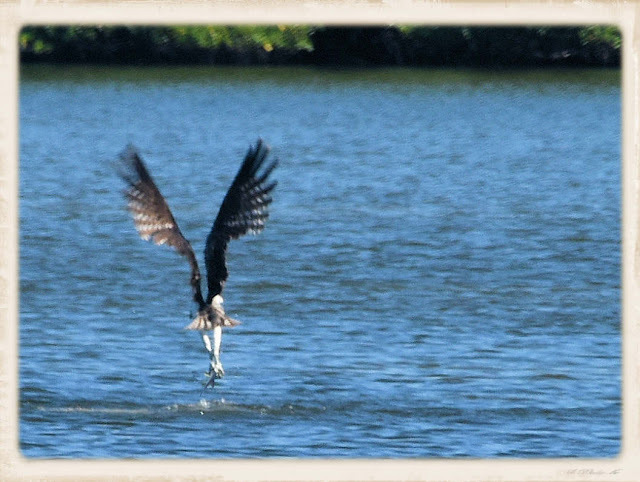 He flew off as the fish dropped to the ground. Interesting, he headed back to the bay as I watched, wondering what he was doing. 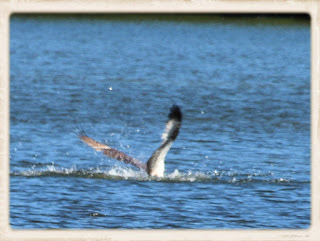 He flew low over the bay and dipped his beak and talons into the water a few times. He was obviously, washing up after the meal. When I returned from the trip, I reviewed the photos that I had taken. Unfortunately, I discovered a sad injury to the Osprey. 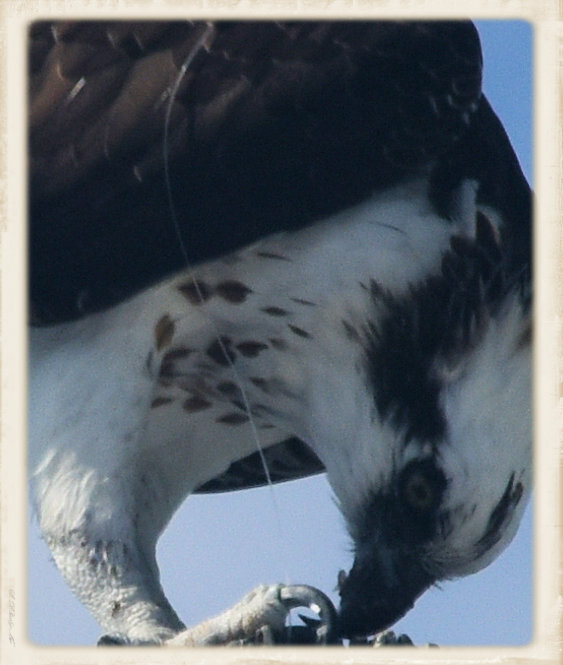 If you look, you can see fishing line hanging down from the Osprey's wing, about 12-16 inches long. It appears that a hook has become embedded in his wing. He probably got hung while diving into the water. 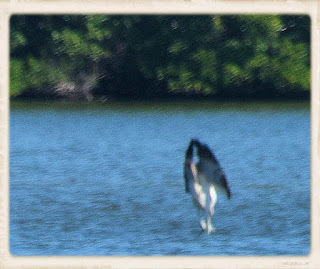 As I remember, it didn't seem to bother him because I took many photos of this same Osprey over a five day period. He caught fish each day. I could tell it was him by the fishing line hanging down from viewing other photos from different days. Ospreys are very good fishermen....even while being injured. 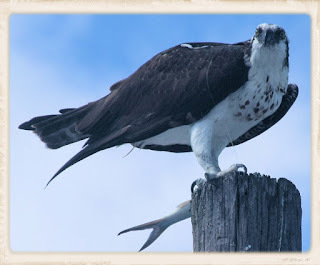 Ospreys are awesome!!! Oh yeah, I hide things in the lake waters, such as a tiny mermaid/fish. Folks love to search for them. Also, you can personalize your lake map with a star where your lake house is located. I call my maps, treasured maps because most folks have that special body of water that they treasure. My treasured maps make a great Christmas gifts for the fisherman, lake lover, lake house. Add beauty with lake cabin decor, lake decor, lake cottage decor, or buy as a lake gift. Order soon to avoid the rush! Makes the best 2018 Christmas Gift. I've seen them out here on occasion, but not like the photo's you got. Great photography.